Creating a new kitchen is one of the big investments you make when updating your home, so it is important that you make sure you get the kitchen lighting right. The kitchen is the centre of the home. It is not just a kitchen, it is a dining room, living room, in fact the heart of the house. The only way to change it throughout the day to become a living working space is with the lighting. This needs to be flexible, atmospheric and up to the task. What you should avoid is a solid grid of downlights evenly spread across the ceiling, instead concentrate on where you will need a particular function from the lighting and work out which fittings and which positions will be best to achieve what you want. Do remember that the best time to install a new lighting scheme is before you start to redecorate – not after. A downlight, such as the LED Polespring will bounce light off fitted cupboards, to create a softer diffused light and a greater sense of space. Lighting cupboard doors will also reflect light on to the work surface below and help you see inside the cupboards when they are open. For high ceilinged kitchens, consider uplights on top of the kitchen cabinets to add to the general light in a kitchen while reducing the number of downlights you’ll need. Always light the central island with recessed downlights and for effect combine with simple decorative pendants. These would be selected to suit the style of the interior. To make it easier to control the mood, put them on a separate circuit to your perimeter lights. For added impact, try adding a pair of Polesprings or, for a contemporary look, use a Square Double Trim or Trimless. 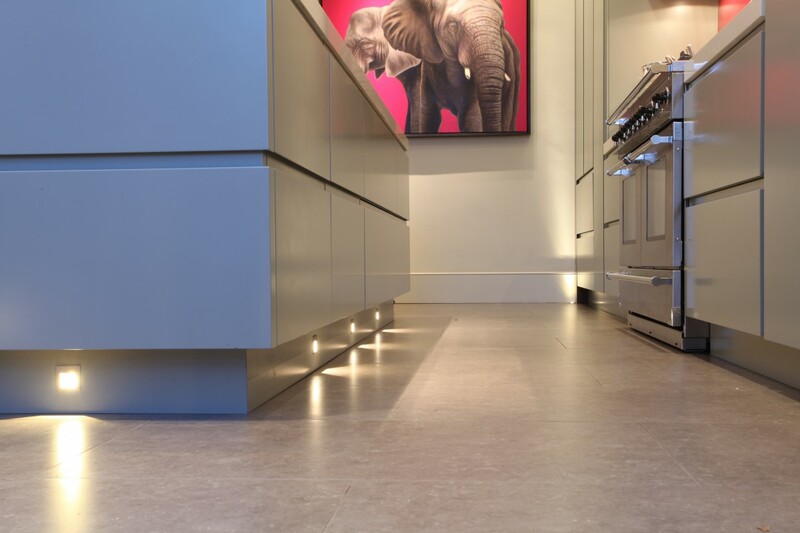 For mood lighting, fit LED Cazalla lights into the plinth of your units or central island to provide a gentle wash of light across the floor. If an island unit is on legs, you can create the impression it is floating by using LED Contour underneath it. Light shelves with individual LED Footlights or LED Undercupboard Lights. They are a particularly useful solution when it isn’t possible to fit a recessed light above a work top or if the shelves are under a skylight. Small LED Undercupboard Lights are a good way to light work surfaces and create shadow-free task lighting in the areas where you do the most work. 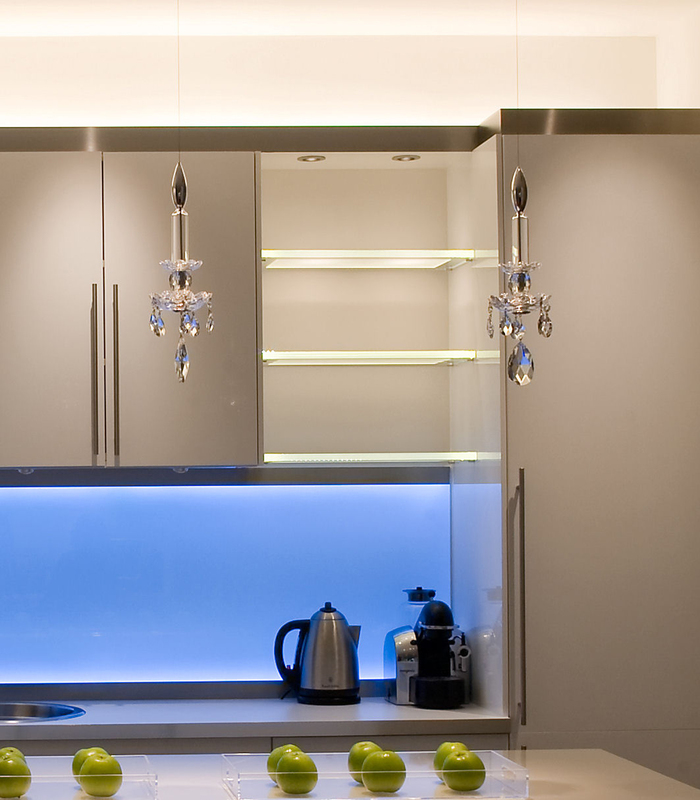 For a more unusual and fun solution, use the Contour RGB LED strip that change colour to backlight a glass splashback. Cooking creates a surprising amount of grime and it is surprising how much of it collects on exposed light fittings, so opt for glass covered fittings over cooking areas. If in any doubt, one of our lighting designer can help you and you can be safe in the knowledge you will avoid costly and time-consuming mistakes and end up with a kitchen which looks as beautiful as you hoped – at any time of the day and night. 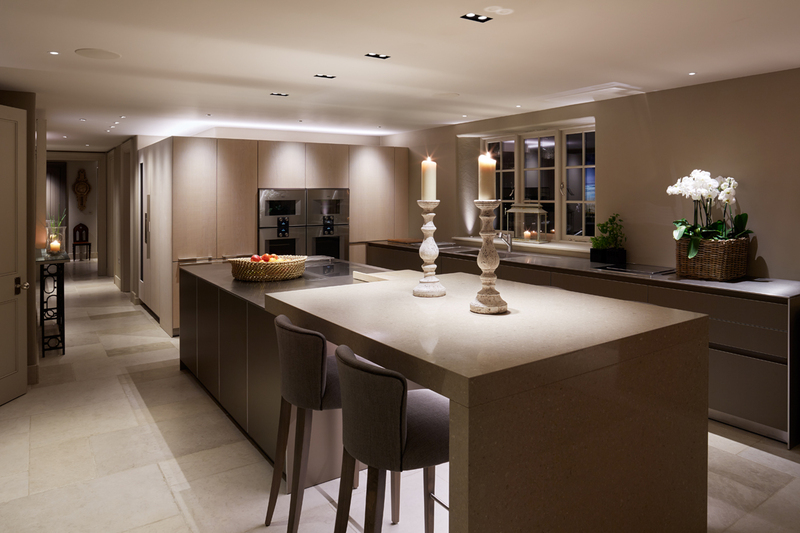 For further inspiration, do visit our Kitchen Lighting Project Showcase.